By Preston Hatfield (Yamanashi-ken, 2009-10) for JQ magazine. Preston received a B.A. 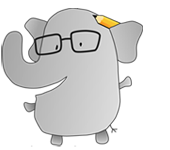 in English literature with an emphasis in creative writing and a minor in Japanese at the University of California, Davis. After spending an amazing year on JET in Yamanashi, he spent a year writing and interning with book publishing companies in New York. He currently lives in Marin County, where he continues to cover local Japan-related stories for JQ, and teaches English as a second language at an international school in San Francisco. 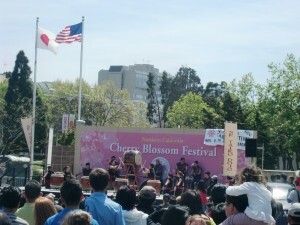 This April marks the forty-sixth time that San Francisco has hosted the Northern California Cherry Blossom Festival. As one of the world’s top annual festivals of its kind and one of the largest Japanese American events in the country, the festival has made quite a reputation for itself, and each year it’s bigger and better. Whether you’ve been to Japan before and need a fix of your favorite street food, or you’re a newbie interested in exploring the culture, the NCCBF offers a comprehensive and top-notch Japan experience that includes traditional and modern elements. The festival has become something of a culture treasure here, and it’s no wonder. San Francisco, with a formidable but recently declining Japanese American population, is home to one of the last “true” Japantowns in the U.S., but some locals think that’s debatable. “I saw [at the festival] a hardworking community [bringing] culture and fun to Japantown, which for the rest of the year is slowly being eaten by non-Japanese businesses. Koreatown sometimes feels more appropriate,” said Bay Area resident and JET alum Mikeal Gibson. 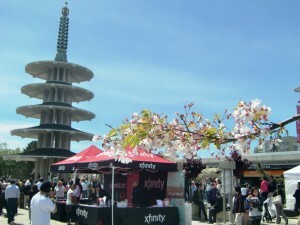 Ironically, the festival’s success and massive crowds (around 200,000 annually) belies Japantown’s need for preservation. To the once a year visitor, the hordes that gather would appear evidence that the community is booming. What they don’t see is longtime neighborhood installments closing their doors (most notably in 2011 when the Uoki Sakai Market closed after serving the community for 105 years). As the festival continues to diversify and expand, its influence and prominence in the city is further solidified—Okamoto reflected that one of the positive changes taking place in the festival in recent years has been the increase of gay Asian groups and anime groups. This year, the neighborhood appears somewhat rejuvenated thanks in part to new cherry trees, which were planted by volunteers from the Japantown Youth Leaders organization along Laguna and Sutter Streets. With only a scant few blocks around Peace Plaza, the neighborhood is drafting a document called the Japantown Cultural Heritage and Economic Sustainability Strategy, which is designed to help maintain Japantown’s cultural integrity and boost its tenuous economic stability. Participants from the Rosa Parks Elementary School’s Japanese Bilingual Bicultural Program have also been working to have Japantown included in District 5 for city redistricting in order to keep the community united. 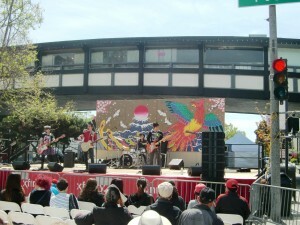 The JBBP, whose founding principles according to Hamilton were to “help the Japanese American community retain the Japanese language and cultural heritage that was in danger of being lost after the internment and the dispersal of the community by redevelopment,” has been involved in the festival for the last 30 years, participating in the parade and selling Sakura Popcorn. While numerous groups like the JBBP are staples of the scene, there are always a host of new artists and performers representing different facets of Japan’s identity. Enter American J-rock band and first-time festival participant, akai SKY. This edgy foursome treated a Saturday afternoon crowd to a unique sound born out of the American and Japanese rock traditions and proved unequivocally that J-rock isn’t a plant for just one kind of garden. There’s certainly something to be said for local color. San Francisco has its own immutable identity and progressive values that have, for better or worse, shaped us as individuals into a greater community that is every bit as iconic as any of the city’s landmarks or fashion trends. In another city, maybe akai SKY never exists, the JBBP is decommissioned, and Japantown doesn’t endure the test of time. As San Francisco goes, so too does the festival. Although Japantown’s fate remains to be seen, the 46th annual Northern California Cherry Blossom Festival was a smashing success, a celebratory extravaganza fit for a shogun’s court. Bay Area residents can rest assured that they can look forward to another festival next spring. Until then, they can sustain themselves on the wonderful afterglow of this fantastic event—the amazing food, the party atmosphere, and of course, the community that shared their culture with them; or better yet, they can hop on down to that lively little nook next to the Western Addition (look for the pagoda on the skyline) and treat yourself to whatever Japanese indulgence you desire.